Sierra On-Line’s 1995 Phantasmagoria by Roberta Williams has not aged well. Its dated graphics, preset viewpoints, and one-button point-and-click interface mark it as the pinnacle of a short-lived movement in gaming that was quickly supplanted by more modern polygonal 3D graphics, free-look exploration, and real-time motion controls. Bernard Perron cites reviews of the game that call it a “disaster” and argues that, with Phantasmagoria as the most visible example, “the failure of the interactive movie seems to be total… Interactive movies demonstrate that it is not always pertinent to try to ‘repurpose’ the analytical and theoretical tools of other fields, in this case film studies, when studying video games” (p. 238-239). As Perron’s argument demonstrates, Phantasmagoria is generally held up as a parable about why games should not aspire to be movies, and consequently how limited film scholarship is to address games. Furthermore, Perron’s criticism touches on how the focus on Phantasmagoria’s failures illustrates the larger problem of focusing too much on the spectacle of games in game criticism, and not enough on the gestalt effect of games. Phantasmagoria is not actually a bad game—it can be a powerful experience on a first playthrough, although it admittedly lacks replayability value—and it becomes even more fascinating if we consider that it might have a different goal than most horror games. Therefore I would like to read it as a translation (in certain respects) of a similarly short-lived, and often derided, popular entertainment genre: the Gothic novel. There are two general ways to define the Gothic novel: by time period or by textual features. The Gothic novel’s time period is generally agreed to be between 1764 and 1820. Classifying textual features of the Gothic novel is trickier and more debated. Still, there is some agreement that certain features distinguish the Gothic novel from other types of novel, and also from the more recent horror genre, for which it is considered to be a precedent. Generally, the Gothic novel is characterized by setting, supernatural elements, emphasis on emotional responses, tone of terror, and a cast of conventional characters that includes a persecuted heroine and an oppressive Byronic villain. The setting in the Gothic novel, as Robert Hume notes, must be “sufficiently removed from the reader of 1800 that there would be no intrusion of everyday standards of factual probability and morality… Time and space are irrelevant (real historicity is very slight) as long as they are vague or remote” (p. 287). This distance accounts for the medievalized haunted castles, ruined abbeys, and so forth that are common to the Gothic novel and from which it gets its name. But they have another function as well: Davendra P. Varma argues that setting is the “passive agent of terror” in the Gothic novel (while the villain is the “active agent”) (p. 19). George Haggerty notes that “space is always threatening and never comfortable in the Gothic novel” (p. 20). Furthermore, the setting allows for supernatural occurrences (although in later Gothic novels, these are often explained away), enhancing the removal from the audience as well as the tone of terror. It is important to distinguish between terror and horror when discussing the Gothic. For Edmund Burke, whose definitions are generally used both by Gothic authors and critics alike, terror is the sense of dread, the anxiety produced by the sense that there is something just beyond perception at play; horror is the realization of that dread, the actual encounter with something shocking. Thus, the Gothic, as a literature of terror, emphasizes dread and oppressive feeling, whereas modern horror emphasizes shocking experiences—jump scares, grotesque images, violent actions, and so forth. Significantly, the Gothic novel appears in English literature as a rejection of the rationalism, realism, and moralizing that characterized other early forms of the novel. It was a sensational genre, focused on evoking strong emotions in its reader that transcend reason and intellectual response. It was a genre noted for its troubling morality, for reveling in violations of sexual norms and in violence. But it was also a genre, like many sensationalgenres, that aged quickly, and almost as soon as it appeared was subject to ridicule. 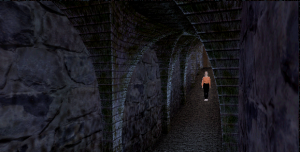 At first glance, Phantasmagoria is a heavily cinema-influenced horror game. However, the game’s lack of actual horror until the seventh, final chapter marks it as either an incompetent example of horror, or as something else altogether. The game itself offers a tantalizing key to its interpretation: one of the most ambiguous objects in the game—yet also one of the most essential for advancing the plot—is a copy of John Polidori’s The Vampyre. Adrienne (the playable character) only reads aloud the title and author, so that the player, without outside knowledge, might believe that it is a made-up book. The Vampyre is not well-known outside certain communities, but it is generally recognized as the first complete vampire fiction published in English. The plot of Phantasmagoria has nothing to do with vampires (unless demonic possession is a sort of vampirism). Because the book’s function in the plots of the game is as a gift from Carno to Malcolm, its presence could suggest that Carno is like Ruthven and Malcolm like Aubrey, but the book might also be an invitation to read the entire game as an exploration of the relationship between past and present popular entertainment: here is the supernatural literature of fear from the past embedded in an example of the supernatural literature of fear from the present (that is, 1995). 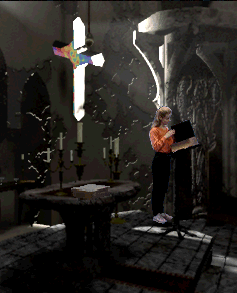 The book’s functions in the game are not extensively explained, but few of the mysteries in Phantasmagoria are. There are two distinct but interdependent narratives in Phantasmagoria. The player, as Adrienne, enacts the present-plot, which is set in the mid-1990s (contemporary for the audience at the time of release), and this plot more closely resembles contemporary horror fiction, with its emphasis on unwitting characters being subjected to the supernatural with violent results. In contrast, the past-plot is experienced purely passively, embedded in the space of the game and inflicted on both the player and the character in the form of graphic video-sequence visions and significant artifacts throughout the game. It is not necessary for the player to piece together all of the past-plot to fully understand and enact the present-plot (emphasizing the passivity with which Adrienne must experience the past-plot). For the player, the past-plot functions like a Gothic novel, set in a remote time and space (that is, a small island off the New England coast in the late 19th century). It features Carno as the villain-hero who, for Hume, is the structural feature of the Gothic novel, and as such is the source of the supernatural elements that cause the horror in the present plot. There is even a conventionally ruined chapel in the house. It is never fully explained. The house governs nearly every part of the game: it is the source of isolation; it is the containing structure for both the supernatural demonic presence that drives the plots and for horror and terror; it tells the story itself through architecture and spatial distribution of plot elements. To explore the house is to especially explore the past-plot. 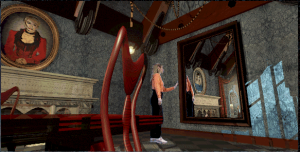 Narrative is spatially embedded not just as a function of Phantasmagoria being an adventure game, but explicitly for Adrienne, who experiences the past through psychometric encounters with the house. The present plot is subject to the “intrusion of everyday standards of factual probability and morality” because it is so close to the player’s reality, with its modern touches such as the laptop computer, the telephone repairman, the car that Adrienne takes into town, and so forth (Hume, p. 287). Contemporary sensibilities guide both gameplay and interpretation; the player is invited to agree with Adrienne’s judgments—e.g., that the house is creepy or that Don is behaving inappropriately. The 19th century mansion, then, serves for a 20th century audience what the medievalized castles and ruins of the Gothic novel served for its audience. It is the remnant of what is perceived as an oppressive past, where not only is the physical space confining, but so is the moral space. The present audience both for Phantasmagoria and the Gothic novel is likely to feel morally superior or enlightened in comparison to the past in which the terror of the plot occurs, and suspending that present sense of morality allows for increased terror. 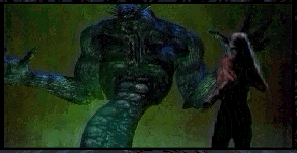 It is not my assertion that Phantasmagoria merely contains a Gothic storyline; rather, Phantasmagoria effectively translates the Gothic into game form, situating it appropriately in the new context. It does not translate a particular Gothic novel, but the genre itself by creating an original plot that employs the key elements of the Gothic novel, but in a way that is understandable to the audience of its time. The innocent heroines and sensational premises of the Gothic novel do not translate easily into late 20th century fiction, which expects a certain kind of psychological realism and believability of its characters, plots, and settings. The success of Phantasmagoria is in translating the tone of the Gothic novel, the sense of oppression and deep terror. After all, games are an experiential medium, just as the Gothic novel tried to be. No, Phantasmagoria is not scary by current conventions of horror, or even by 1990s horror conventions. It makes an attempt; there are a few genuine jump scares, and the last chapter is filled with conventional horror gore, but most of the game’s aesthetic relies on exploration in a space filled with the potential for horror, which is where a the sense of terror comes into the game. But perhaps the most interesting aspect of the translation of the Gothic mood into Phantasmagoria is the social contexts of both the Gothic novel and Phantasmagoria. 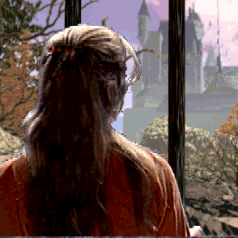 Although in many ways, Roberta Williams and her team at Sierra could not have anticipated how apt the translation would be (the clarity of historical interpretation is not a luxury available to those currently in the historical moment), the Gothic novel was an apt genre to appropriate to express the exact moment that 1995 was for video games. The Gothic novel appears in a moment of intense literary development for the novel, when it becomes a mass popular medium but there is still a lot of experimentation going on as authors and publishers explored and settled on publication practices. It is before the conventions of the serialized novel that give us the great 19th century authors such as Charles Dickens and give the novel its now-familiar forms, but after the initial sensationalism of the novel (as seen in Pamela’s popularity) had worn off. Novels at the time were the source of great anxiety over their effects on the young people who consumed them, as they were attributed with corrupting moral sensibilities. 1995, for video games in general and specifically for PC games, was a similar moment. The PC game (and Sierra’s role in its development) had been around long enough to establish certain conventions firmly, but was still in a time of great experimentation because development and distribution technology was rapidly changing. There was great anxiety about the influence of these games on the young people who were supposedly playing them—as, for instance, Phantasmagoria’s distinction of being the first game banned under then-recent Australian laws suggests. 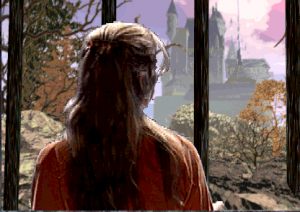 The cinematic style of Phantasmagoria reflects the surety that many players and designers had at the time that incorporating live actors and video footage into games was the future of the video game, a sentiment that had surely been sparked by the success of Myst in 1993. But this was a short-lived moment, as was the Gothic novel’s moment (relatively speaking). Soon after Phantasmagoria, polygonal 3D graphics became the industry standard and demonstrated themselves to be the actual future of gaming (although, of course, now we often use live actors with motion-tracking technology, which is sort of a hybrid of the two techniques). Phantasmagoria quickly came to be seen as clichéd, overwrought, and technically insufficient. The acting, to a 21st century audience, seems melodramatic and wooden by turns, and the integration of live actors into their computer-generated environment seems hopelessly limited by conflicting resolutions between video and background, appearing to a modern audience as lower quality than what most people can do with Photoshop in a day, despite what was in 1995 an impressive orchestration of all of the above. In short, the game is dated. The Gothic novel is no less dated. In the same way that the intensely popular works of our own time soon spawn parody and mockery—see, for instance, the internet’s response to Twilight—the Gothic soon became subject to such scorn. Its sensationalism soon became melodrama to an audience already accustomed to its conventions and no longer interested in rejecting 18th century rationalism (because it had already been rejected for them). It has not aged well in the intervening time either; a 21st century reader is more likely to laugh at the apparent absurdity of the Gothic novel than to shudder with genuine terror, although contemporary accounts of the Gothic novel suggest that audiences at the time did indeed respond with the intended terror (and such accounts also came to be ridiculed and parodied). That Phantasmagoria has aged so poorly actually indicates the effectiveness with which it translated the Gothic novel. It responded to a specific historical moment in the same way that the Gothic novel did, appropriating the Gothic material in order to make that response. But history has responded to Phantasmagoria in the same way: treating it as a misdirected and hopelessly dated artifact of a short-lived period of time that is sandwiched between what became more significant moments in the grand historical narrative. Finally, it is worth noting that Phantasmagoria is aptly named, and named clearly for the past-plot. The title stresses the 19th century aspects of the game, as does the physical space (the house, for instance, must be refitted for electricity and telephone since its original construction). The phantasmagoria was, in the late 19th century (when the past plot is set) a popular sensational entertainment, in which audiences would view a series of horrifying images in rapid succession. For Adrienne and, by extension, the player, that is what the relationship between the past and present plots is: a series of horrifying images in rapid succession, experienced by the present audience but originating in the past. Haggerty, G. (1989). Gothic Fiction / Gothic Form. University Park, PA: Pennsylvania State UP. Perron, B. (2003). From Gamers to Players and Gameplayers: The Example of Interactive Movies. In J.P. Wolf and B. Perron (Eds. ), The Video Game Theory Reader (pp. 237-258). New York, NY: Routledge. Varma, D. (1957). The Gothic Flame. London, England: Arthur Barker.